Boryana G. Arsova, Attorney at Law, LL.M. Boryana is passionate about the law, especially transnational legal issues. That passion is evident in the ardor with which she pursued her legal education. She took her J.D. “with Great Distinction”, graduating near the top of her class at McGeorge School of Law. She was a Legislative and Comment Staff Writer on the McGeorge Law Review, and named Order of the Coif. She received an LL.M. in Transnational Business and was first in her class in Transnational Litigation and Legal Process. All of this she accomplished in English, her second language. Boryana brings the same passion to the practice of law. Boryana is admitted to practice in both New York state and California. She ardently represents clients in business litigation, trademark and trade name matters. Ever curious, Boryana has superior research skills and is quick to identify creative avenues for resolving disputes. 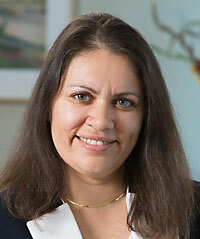 Boryana is a native of Bulgaria and brings a sharp international perspective on legal issues to Martensen Wright PC.